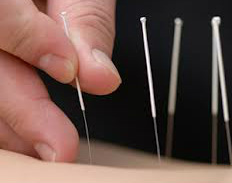 Also called "dry needling", it describes an approach that interprets acupuncture phenomena according to current scientific understanding and integrates acupuncture within other forms of western medicine or therapies. A western acupuncturist makes a medical diagnosis in the conventional way, uses needles to influence the neuro- physiology of the body, and regards the acupuncture as part of the treatment. Acupuncture is generally regarded as being a very effective form of pain control and is a useful tool for acute episodes of muscles spasm, muscle sprains, "pulled muscles", etc.